The great Talmudic sage Hillel was born in Babylonia in the first century BCE. As a young man he came to the Holy Land to study Torah at the feet of the sages of Jerusalem. He was initially a very poor, but brilliant student, and became a famous Torah scholar and eventually the Nasi (president) of the Sanhedrin. 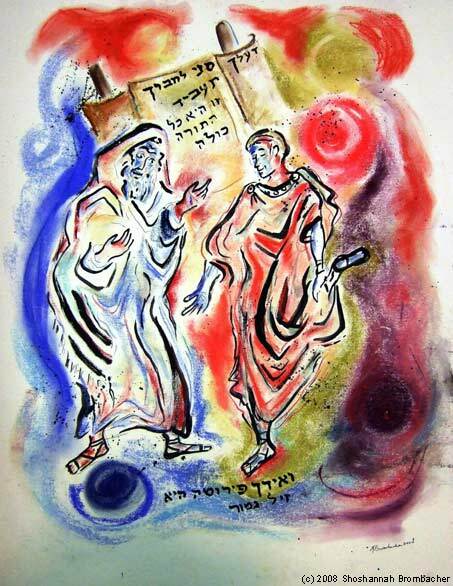 He is often mentioned together with his colleague, Shammai, with whom he often disagreed on the interpretations of Torah law: Shammai often follows the stricter interpretation, whereas Hillel tended toward a more lenient understanding of the law. In the great majority of cases, his opinion prevailed. Hillel encouraged his disciples to follow the example of Aaron the High Priest to "love peace and pursue peace, love all G‑d's creations and bring them close to the Torah." Hillel was a very humble and patient man, and there are many stories that illustrate this. "What is hateful to you, do not do to your neighbor. That is the whole Torah; the rest is the explanation of this—go and study it!" Text and image by chassidic artist Shoshannah Brombacher. To view or purchase Ms. Brombacher's art, click here. Ra and Osiris This is why, I suppose, the principle corruption of humanity is the worship of idols. The idols confound rather than clarify.